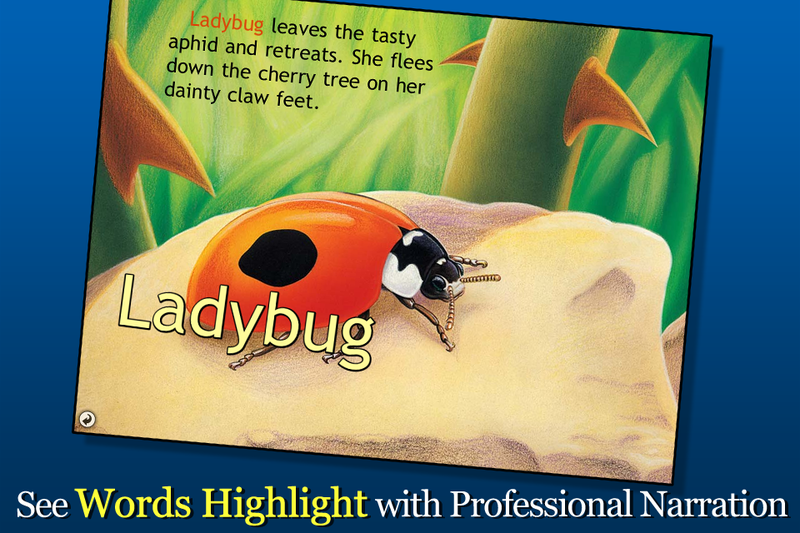 Ladybug at Orchard Avenue is a lovely little title from Oceanhouse Media's Smithsonian Collection - a series based on popular non-fiction print titles about the natural world. The print version of this title was released in 2009 along with an audio cassette, revising an older Soundprints title from 1996. As an OM book published for mobile devices in 2012, this title sparkles, giving enormous value over its print counterpart, including narrated text that highlights as read. This book series fills a great need for digital book apps with non-fiction educational content. The books selected so far have been well vetted as print titles, making it easy as parents & educators to select these digital books with confidence. This title covers the life of ladybugs with lots of great information about their lifespan, ecosystem, etc. It even inspired my child and I to research about ladybugs online, finding out that "Boy ladybugs are called ladybugs, too." (which was a difficult fact for my little boy to accept without proof beyond his mom saying it was so). Each title in this series takes the original print images and pans over them in a nice, semi-animated style. There is also a nice array of sound effects, like birds chirping, plus leaves and grass moving in the wind, paired nicely with a great male voice-over. The sound effects also help the story come alive without overshadowing the narration. Overall, this is a solidly made book with nice enhancements. If you tap anywhere on the page, words appear that represent the different images (e.g. 'ant', 'ladybug', 'leaf'). If that word also happens to be part of that page's text, the word is highlighted within the text of the story, helping young readers make important connections between the written and spoken word. Paired with OceanhouseMedia's omBook's template, non-fiction titles get a clear educational boost when print goes digital. As a way to foster a child's love of the natural world this app series gets high marks. It is well developed and based on sound scientific information. There are even a few pages at the end with extra educational content about ladybugs. These books are also beautifully presented with nice illustrations and light enhancements that make the print titles come alive. Recommended! A ladybug appears on a leaf and confronts an ant, with his jaws shown as much larger than the ladybug's head ('like a giant pair of pliers'). She feels the ant near her, but cannot see him well with her multifaceted eyes. She is busy hunting prey of her own, a tasty and tiny aphid. The ant then strikes her, finding her shell instead, which protects her from predators. The ant is actually defending his 'herd' of aphids, which his colony keeps for their sweet honeydew droppings. The ladybug escapes the danger of the ant and heads to a new hunting area, as she needs to store fat for the long winter. A bird tries to eat her, but hesitates, finding the bright red of the ladybug's shell to be a warning that this is a bug that will not taste good. The ladybug falls off her leaf, though, but luckily she lands safely. Then when a mouse tries to eat her, she is stuck on her back but defends herself with a 'foul-smelling yellow liquid' that oozes out of her leg joints. This offends the mouse and he runs away. She can turn herself over with her fore wings and is back on the hunt for food. After a meal of aphids the ladybug rests before returning to a window sill, where she can find a spot to squeeze into a nearby house for a warm place to sleep for the winter. This is called hibernating and can be done in large groups in the wild or small groups in homes.